To celebrate last week’s paperback release of Petit Lot et le Grand Cor de la licorne, I’m giving away ebook editions of Littlelot and Petit Lot. Right now you can download The First Story of Littlelot, Littlelot and the Real Monster, as well as Petit Lot et le Grand Cor de la licorne, for free to your Kindle or Kindle app. I am thrilled to present the final rendition of the illustration for the cover of Petit Lot et le Grand Cor de la licorne. David prefers to illustrate for narrative works, including book cover and interior illustrations, comics, and graphic novels, as well as articles, poems, and book excerpts. He tends to use traditional, old-school media: gouache, watercolor, acrylic, and pen and ink. In the painting above, as in much of David’s work, there is no digital rendering. See the illustration at previous developmental stages in the category Couverture on the book’s website. Tomorrow on that site I’ll show the book cover for the electronic edition. For more of David’s art, browse his website. Born and raised in Fort Lauderdale, Florida, David Jones crossed the country to study art on the West Coast. He graduated from the Academy of Art University in 2016 and makes his home now in San Francisco. David’s art is influenced by John Bauer, N. C. Wyeth, and Arthur Rackham, painters from a more romantic time. Stephen Wendell is the author of the Littlelot series of books for children and the grown-ups who read to them. 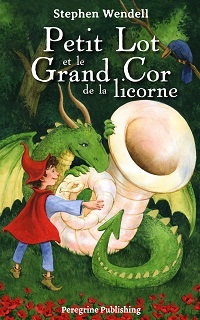 The English translation of his latest title, Petit Lot et le Grand Cor de la licorne, will be the next book in the series: Littlelot and the Great Horn of the Unicorn. To celebrate Littlelot’s print release, we’re having a Countdown Sale on the Kindle edition of The First Story of Littlelot. The countdown sale begins today 8 a.m. PST at $0.99. The 99-cent price will hold through the weekend. The price goes up to $1.99 Monday 4 p.m. PST. The sale ends next Friday at midnight PST when the price goes back to its normal $2.99. Peregrine Publishing is pleased to announce Littlelot’s print release. The First Story of Littlelot and Littlelot and the Real Monster are available in ebook and, now, in paperback. 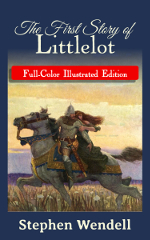 The First Story of Littlelot is also available in a Full-Color Illustrated Edition. The frontispiece and six chapter illustrations by celebrated artists Arthur Rackham, N. C. Wyeth, Thomas Moran, and Herbert James Draper bring Littlelot’s Arthurian adventure to life in this beautiful paperback book. My mom told me I had to clean my room because toys were scattered all over the floor. It’s a lot of fun taking toys out of the toy box to play with them, but putting them back in is a chore. It would be easy if I were a wizard, like Merlin in the picture book I read with Granddad. I’d just raise my arms, close my eyes, and say the magic words: “Anath orthibis bethad!” and all the toys would be back in the toy box. When I opened my eyes, the toys were still there. Then I ran around the room as fast as I could, picking up toys. When I came around to the toy box, I dumped them in and kept going. Once, twice, three times around, picking up toys and dumping them in the toy box. I opened my eyes. The floor was clean and all the toys, in the toy box. Stephen Wendell is a grown-up who believes in magic. He’s the author of the Littlelot series of books for children and parents who read to them. The First Story of Littlelot is an Arthurian legend with knights and damsels and other action figures. That’s what I want to be when I grow up! Alas, I was born centuries too late. As were you, Young Reader, if such might be your own grown-up ambition. Left to us in our times are stories of those chivalric heroes, models that we may yet apply to our modern lives. 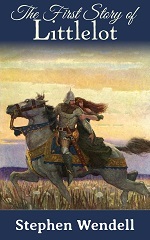 The First Story of Littlelot recounts the adventure of the most renowned of all the Round Table knights, Lancelot, and his rescue of Gwenevere, drawn from Book VII of Le Morte d’Arthur. 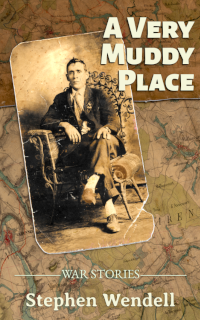 My own retelling differs from Malory’s in length as well as in certain details. Terror wights don’t read. But Roy gets more fan mail than I do, so I read it to him. He really appreciates your kind words, and he adores the photographs and hand-drawn pictures. I made a page for Roy, so his fans can keep up with his latest exploits. Roy’s page has links to all the articles featuring your favorite terror wight, plus this candid shot I got of him earlier today. You can leave a message for Roy in the comments section. Roy really wants you to have a copy of his ebook. 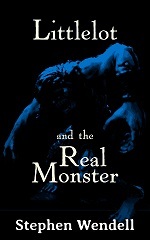 Right now, he’s giving away the Kindle edition of Littlelot and the Real Monster. The terror wight still doesn’t grasp the concept of an electronic book. To get your Kindle edition of Littlelot and the Real Monster from Roy’s “really big” stack, click this link to its Amazon page. The give-away ends Monday at midnight (Pacific time, GMT-8). That’s 9 a.m. in Paris, Roy’s bedtime. He hopes to go back to the figurine drawer empty handed. Please don’t disappoint the terror wight! Currently available in electronic form, The First Story of Littlelot and Littlelot and the Real Monster will be in print in the spring.